You are here: Home / How To Get Rid Of.. / How To Get Rid Of Hiccups? Occasional hiccups may seem funny initially but you would surely like to know how to get rid of hiccups when the same ‘hic’ sound starts annoying you after a while. The exact cause of hiccups is not known but it is considered to be a reflex action triggered by stimulus to vagus or phrenic nerves which causes involuntary contraction of the diaphragm. The characteristic ‘hic’ sound is produced when the opening at the top of air passage snaps shut. Apart from these common causes, hiccups can be caused by serious issues like lung disorders, liver disease, myocardial infarction, meningitis, bowel obstruction, kidney failure, ulcerative colitis, abdominal surgery, stroke, brain tumor and other problems associated with central nervous system. 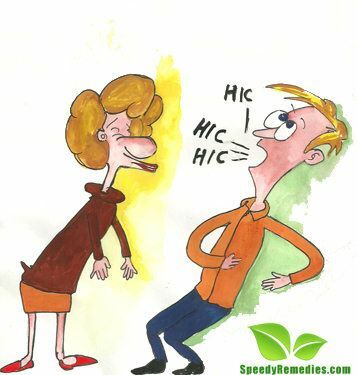 Hiccups (or hiccoughs) are generally not considered serious unless the problem persists longer than a couple of days. When bouts of hiccups persist longer or when symptoms like heartburn, chest pain, abdominal pain, fever, difficulty in swallowing etc appear then it is better to consult your doctor rather than experimenting with ways to get rid of hiccups. • Gulping down a glass of water quickly is one of the most common home remedies for getting rid of hiccups. • Eating ice is another popular natural cure for hiccups. Another trick to stop hiccups involves gargling with ice water. • Taking a combination of one tablespoon Indian gooseberry juice and 1/8 teaspoon of nutmeg powder is useful in the home treatment of hiccups. Follow this therapy about three times in a day. • Drinking a glass of buttermilk mixed with half a teaspoon of crushed or powdered black cumin seeds serves as a valuable home medicine to get rid of hiccups naturally. • Having a teaspoon of pure orange juice, vinegar or other such item that is bitter in taste can help relieve hiccuping. • In case the problem is accompanied by heartburn or indigestion then have one tablespoon of mint leaves mixed in a cup of water to relieve hiccups and other related symptoms. • Chewing a few dill seeds or sucking a slice of lemon can also prove helpful in healing hiccups. • Pulling on your tongue or massaging the roof of mouth can work as natural hiccup remedies because it tends to stimulate the vagus nerves and breaks the spasm. • When dealing with hiccups, it is often suggested to take a deep breath, hold it for 10 seconds and then release it. Continue for about five times. The principle behind this therapy is to disrupt the hiccup cycle. • Simply holding your breath until a count of 20 is another popular tip to get rid of hiccups without much trouble. • Another similar hiccup remedy is to hold a paper bag and breathe in it for about 20 times. This tends to encourage deeper breaths and hence helps control the contraction of diaphragm. • Swallowing a teaspoon of sugar is considered useful in reducing hiccups naturally. Eliminating hiccups by placing a little bit of honey on the back of tongue is another easy cure for this problem. If you do not like honey then may use peanut butter; the idea is to use something sticky on the back of your tongue. • Coughing or inducing a sneeze can also help stop hiccups by distrupting the hiccup cycle. Here’s an interesting video showing how to get rid of hiccups. In case you are looking for tips on how to get rid of hiccups for somebody else then try to engage that person’s mind elsewhere to distract him/her. Applying some naughty ideas to scare your friend all of a sudden to induce sudden fright can also prove useful; even if you fail, the excitement of having escaped your prank may help end your friend’s hiccups! Everybody please rest assured. Hiccups are curable. 100%. Everybody say good-bye to any hiccups sufferings, or mere annoyance from ordinary hiccuping. Why? Because I got something that will bring back the joy of life to you. You will be free to do anything you want, the way you want, enjoy eating your food any way – too quick, or too much, or fat and spicy, enjoy anything in life that might trigger hiccuping, and in case you are bothered by hiccups, you will just laugh them away. You will know why right now. Because I got the UNHICCUPER, or the HICCUPS BUSTER, that gets you rid of hiccups in just 15 seconds, every time without fail. This dream cure is the only working one on the planet and will get the world rid of hiccups once and for all. There will be no more uncontrollable, or unstoppable hiccups. Them hiccups will become history. Everybody will know how to get rid of hiccups and will forget, that hiccuping ever was a problem. Many factors cause hiccups, but finally all of them result in spasms of the diaphragm. The main effect of the unhiccuper is in getting your diaphragm rid of spasms. You can do it everywhere in case you start hiccuping. It is very easy and 100% safe and effective. Here is what to do: Standing, or sitting on a chair, lean your head backwards as much as you can, to the maximum. Breathe normally. Count up to 15. Slowly bring your head back to normal position. The hiccups are gone (for a long time). I am getting so many useful information about get rid of hiccups.Such a excellent post it is. Beautiful. Thanks for sharing this post so much.